Experience an exclusive holiday together with the secret forgotten culture and the beautiful nature of Ibiza! Ibiza is known as an international party scene of celebrities and as the Spanish island that, just as Lloret de Mar (on the Costa Brava), attracts young people from everywhere. That's quite logic, knowing that many celebrities are often spotted here and that there are many famous Djs like, for example, Armin van Buuren, who performs exclusively in the club Privilege since 2012 (before he did in Space). The island's image is confirmed by many famous stars and other jet set coming to big weddings of famous actors or football players. Not to mention that lots of them have their own modern, huge, white villa as a second residence. Nothing is what it seems to be. In Ibiza, just as on the Costa Brava, the opposite is also true. There's another world to discover here and it would be a pity if you didn't look further than just the famous area of Ibiza. The authorities of Ibiza are busy trying to change its international party tourism to a relaxed, cultural and family-friendly one. In the past, this multicultural Spanish island was conquered by the Carthaginians, Phoenicians, Romans, Vandals, Byzantines and Muslims. Some time ago, it was famous to be the painters' island. Luckily, many of the cultural heritages have been conserved, making Ibiza a paradise to culture and relax lovers. Are you coming with you family? Ibiza also thinks about you! There are many excursions to do like, for instance: the Aguamar, Aquarium Cap Blanc, the Bowling Centre, the Cova de Can Marça (a cave of stalactites and stalagmites), the Go-Karts in Santa Eulàlia or Karting Sant Antonio and the Paintball Ibizaventuras or the Lounge and Party paintball. Another interesting option is to take one of the road trains and visit all the high lights while sitting. Ibiza: on land, at sea and in the air. Did you know that you can have an authentic balloon travel and enjoy a unique view from Ibiza and its surroundings? There are also many types of water activities; there are several diving options and there's a catamaran which offers you a relaxing boat trip, while you get tanned even faster than on the beach. Are you an active person? Visit one of the many sailing schools and make a spectacular trip on the water! Ibiza, also called "la Isla Blanca", has a secret appeal to many people. Some of the famous artists that have fallen in love with the island are Shakespeare, Dutch writers as Harry Mulisch, Jan Cremer and Cees Noteboom, the in New York born novelist and non-fiction writer Cliffor Irving, the Belgian photographer and writer Kika D and writers as Gaston Vuillier or Penelope Grogan; each one of them really famous in their branch. To people who have this job, it's very important to be in a relaxing place full of inspiration sources. Of course, Ibiza is not only inspiring because of the newest music beats that are played in the clubs. These literary geniuses met this island of 541 km2 in a different way: with courtesy and hospitality. Moreover, they enjoyed the informal and spiritual atmosphere and the secret cultural treasures. And with, on one side, the inland protected by an area of dunes and, on the other side, the coast full of cliffs. Don't forget, by the way, the more than 50 different beaches, because once you've arrived to the island the beach will always be nearby. The fact that Ibiza is a relaxed, informal and inspiring place is already an assurance of all the possibilities you'll find to have your deserved holiday. Do you like warm summers and mild winters? Then the Mediterranean climate of Ibiza is ideal for you! From April till November, temperatures remain between the 19 and 30 degrees. In the inland, during the summer, the thermometer can even reach the 30 ºC. Is that a bit too hot for you and do you prefer a refreshing breeze? Then, stay at the coastline, where, in the summer, you'll feel a smooth wind, between 12:00 and 18:00, that will make the temperatures more bearable. Obviously, temperature depends on many factors, like at which height above the sea level you are. However, one thing that's for sure is that there aren't many changes on the weather conditions, so the average temperatures are always above the 15 ºC. Ibiza is the ideal place to escape from the daily fuss, especially for the winter travellers, because there's very little rainfall (concentrated in October, November and December). The warm sun and the beach Cala d'Hort is for you! Dream away with the mysterious island of Es Vedra in the distance. Where will you lie down on your towel, while enjoying the sun and the music coming out of your iPod? Where will you lie on a sun lounger under a parasol, while reading a thrilling book? Or where will you put some sun cream on your kids and let them play peacefully? Those are difficult questions, because there are more than 50 beaches to choose! 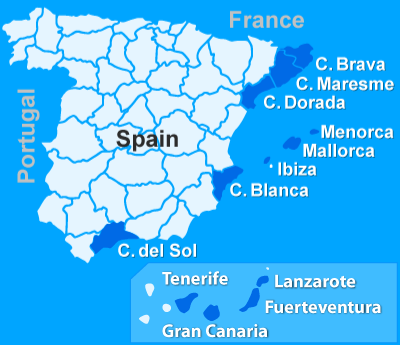 Ibiza city, or Eivissa in Catalan, is the capital of the island Ibiza. This magnificent city is characterized by a 50's look and, besides all the promotion of its nightlife, it has many multicultural heritages. You will notice this, thanks to many monuments, churches and the picturesque alleyways of the old village centre (which is known as Dalt Vila / Upper town). If your intention is not having many cultural trips, then you should at least visit the Can Marçà caves, the Sant Joan village and la Marina, the area where the historical centre begins. Missing a tour to the Cap Blanc Aquarium (also known as Ses Llegostes) in Sant Antoni would also be a crime! A visit here, will give you a general image of the undersea world of Ibiza. Every country and every place in the world celebrates carnival and the people of Ibiza are not different. They have their own competition, in which everyone has to wear a costume without being recognized. You'll find the carnival atmosphere all around the streets in the city centre. During the week-end, there's a parade where different groups of people dance with their colourful costumes. If you get the opportunity to come here, don't forget to make some great pictures of it! The carnival is closed with the so-called "Sardine Burial". This closing ceremony has sardines and wine and it ends with the naughtiest party of the year. Around the 8th of September, the cultural heritage is in the spot lights. It's fun to do the cultural orientation test in the old part of the capital. With the help of a map, you must find the answers of the test, which has history related questions. This is ideal for a day out with family or friends! Dalt Vila, the high city, is the oldest part of Ibiza Town. Stroll through the wonderful maze of small streets. During the second week of May, the area of Dalt Vila (the oldest part of Ibiza capital, also known as the upper town) is transformed into a medieval market with flags, banners and market stands. The details like street musicians, archery, Arabic dances and, of course, the street theatres complete this great atmosphere. Would you like to do something different? An interactive theatre will take you back to the past, particularly to the Renaissance. Every Saturday from 9 a.m., starts a tour in three different languages (Spanish, Catalan and English), at the Mercat Vell, in Ibiza capital. The tour takes about one and a half hour and brings you back to the 16th century. A different experience for all ages! In Ibiza, you'll find plenty of neighbourhood festivities: On the 29th of June, there's a mass at the Church of Santo Domingo; Also in June, there's the festivity of Can Escandell; On the 10th of July, the day of Sant Cristòfol is celebrated in Sa Capelleta; In August, there are some festivities in Platja d'en Bossa and in Ses Figueretes; And, finally, there's the festivity of Cas Serres (September). On the 16th of July, there's an offering to the Virgin Carmen on the sea. After that, the procession continues on the island with traditional live music and a performance of Eivissa's choir. Traditionally, there's a firework competition during the night of the 23rd to the 24th of June. If you've ever been to the Costa Brava, in Lloret de Mar or Blanes, this must be familiar to you, because there it's also celebrated with spectacular firework. The gastronomic week takes place in February. The purpose of it is to emphasize the "haute cuisine" of Ibiza and let it taste to the people who are not familiar with it. Discover the mystery of the island Es Vedra either enjoy a magnificent view from the beach Cala d'Hort. Did you know that 40% of Ibiza is a protected nature reserve and that there's only one river (el riu de Santa Eulàlia), though it's dry nearly all the year because of the high grade of humidity? Ibiza is actually a paradise when it comes to its nature. Photographers get ready and enjoy to the maximum at the photo safari! There are two nature parks: Cala d'Hort and Ses Salinas. From the Torre des Savinar, a medieval watch tower that's already worth a visit on itself, you'll have an amazing view of the nature park Cala d'Hort and the small island Es Vedrà. By the way, you can have the best view of Es Vedrà from the coastal road to Cala d'Hort. Unfortunately it's not possible to really stop up there. The fabulous combination of the flora, fauna and the beautiful large sandy beaches is to admire in the protected area Ses Salinas. It's the most complete image of what Ibiza offers you in the terms of nature. It's interesting to know that the highest mountain of the island is the Atalaya (Sa Talaiassa de Sant Josep), with a height of 475 m. Other mountains tops are the Llentrisca (414 m) and the Furnas (409 m). Have you ever dreamt of being on an inhabited island? Now it's your chance! Visit one of the inhabited islands in the surroundings with your picnic basket, a blanket and some drinks! Ibiza is surrounded by sea water, but on the island there's very few water! Therefore, it's very important to be extra careful about how we use it. The government is working with might and main, but the three seawater desalinization plants are still insufficient to have enough water to use without restrictions. Where there's nature, there must be many sporting options. You'll get to know the true value of Ibiza when you dive under the 200 km of extended coast. Not to the mention, the National Park Las Salinas. Do you need dive material or do you want to learn to dive? There are many dive schools in the area: Active Dive, Anfibios, Arenal Diving, Big Blue Ibiza, Cada Pada Ibiza Diving Center, Ibiza Dives, Mundo Azul Diving Center, Orcasub, Phoenix Dive Center, Scuba Ibiza Diving Center, Sea Horse SubAqua Center, Somni Blau Dive Center (by Punta Dive), Subfar and many others. - Golf: The most famous is Club de Golf Ibiza, which is open the whole year. Besides this one, you'll also find the 9 holes golf course in Roca Llisa. Get ready to slash a ball! - Mountain bike / bicycle: You can hire a mountain bike or bicycle in: Electracar, Ibiza Multisport, Ibiza Mundo Activo, Ibiza Sport, Ibizabtt, Kandani and many more. - Horse riding: Trotting though the forests or galloping on the beach, enjoy the freedom on the back of a horse! You can ride in Can Mayans, Easy Rider, Finca Can Puig, Hipódromo Sant Jordi or in Hipódromo Sant Rafael. - Fishing: Of course, you can fish with a line from the rocks on the beach, but it's more spectacular to fish on the sea, which is now possible thanks to Ibicruisr SL of Pesca Ibiza. Do you want to fish for yourself? Then, you'll need a fishing licence, which you can get in the Consell Insular of Ibiza (Avenida España 49, Eivissa). - Walking: Obviously, you can explore Ibiza for yourself. But would you like some background information without having to follow a guide? In Eivissa capital, you can buy an audio guide just for 12 euro (if you are over 16 years old). The tour is offered in Catalan, Spanish, German, English, French and Italian. Do you prefer markets or shops? There's no accounting for taste, but it's certainly nice and curious to see a different side of Ibiza's fashion, which is usually famous to be so modern. From Friday till Sunday (in the summer), from 11:00 - 24:00. The medieval market has more than 100.000 visitors and is situated in the old city centre. Everything is decorated with the same topic, even the clothing of the sellers, the music and all the products that are being sold: clothes, jewellery and food. You'll also notice the typical Arabic influences from the past in the clothing, food and Moroccan tea. Winter: Saturday from 10:00 - 22:00. Tuesday: In August from 18:00 till 01:00. Sunday: In August from the 18:00 till 01:00. This evening market is a really popular market that attracts people because of its diversity and atmosphere, thanks to the live performances of (local) artists. The market stands, which you'll find on the small alleys and on the bigger squares, sell all kinds of products like clothes, accessories, art, antiques and kitsch. On Mondays, there's paid some extra attention to the children between us. Young, younger, the youngest.... everyone enjoys having a break. Even the merchants understand that you can't shop non-stop, that's why there's plenty of bars and cafes. Summer: Wednesday from 10:00 till 19:00, through all the streets of Santa Eulàlia. It's been 35 years since this big market started and nowadays it's still a phenomenon. The casual atmosphere in this market is inspired by the colourful world of the 70's. You'll find clothing, jewellery, shoes and, of course, 70's music. During the high season, more than 20.000 people visit this Saturday market. There's a good reason for that: it's very diverse. You can buy standard market products or even find fortune-tellers that read the cards or your hand. Even if you believe in it or not, it's a very interesting experience. And who knows... maybe something new happens in your life. If you come to Las Dalias on a Saturday, we have a recommendation from the locals: there's also a part of this international market where Africa is represented and a stand called Namasté ("welcome"), which gives and Indian touch to Ibiza's daily life. .
During the winter, it's a place where local people sell and buy second hand stuff. Their offer is very varied: art, machines, books and, of course, market products like shoes and clothes. Go to Adlib and follow Ibiza's fashion or have a look in Cala Llenya, Las Dalias, Playa d'en Bossa, Plaza de Sant Miquel, Puerto de Ibiza, Puerto Sant Antoni, Punta Arabí, Sant Jordi and S'Alamera of Santa Eulàlia. Eivissa and Sant Antoni are very visited by people who want to party. June is when the opening parties start from, for example, Space and DC10. To have a general image of Ibiza's night life and easily switch from music and club, take the disco bus (during the summer season). Do you prefer bars or lounges? Then, the best option for you is the old harbour area of Ibiza capital. Amnesia (in Eivissa): One of the clubs where famous stars go regularly and drink or dance with their best moves. Some celebrities who were spotted here are: Valentino Rossi, Calvin Klein, Puf Daddy (P. Diddy), Naomi Campbell... Why Amnesia? Because of its great laser show together with its advanced music system and, of course, the best beats of the most famous DJ's who perform there. DC 10 (next to Ibiza's airport): It's the place for the real underground techno. Even if sometimes you can hear a plane in the middle of the music, DC10 is very popular between the local people. It has many dancers and it organises parties like Circo Loco or Pandemonium. Eden (Sant Antoni de Portmany): This place is without any doubts, on of the top clubs. It has 3 rooms in which you'll find styles like R&B, old school dance, Mashups, Hip Hop or Dance Hall. Es Paradis (Sant Antoni de Portmany): A spectacular club that offers you everything you need for a succeeded night: 10 bars, 3 dance floors, lounges, VIP-space and many more. You name it and Paradise has it. Ibiza Rocks (Sant Antoni de Portmany): Live music, music competitions and the participation of Mallorca Rocks. Martina (Playa den Bossa): A relative new club that is getting as popular as Pacha, Privelege and Space. They have paid attention to the smallest details! Whatever your favourite music is, Martina has it. Pacha (at the harbour of Ibiza capital): Pacha is famous in the clubbing scene. The modern and very popular club is specialized in house music, but in its 5 dancing rooms it plays the best R&B and lounge music. Privelege (Ibiza capital): The new home of Dj Armin Van Buuren since 2012 and, besides that, it's also the biggest club with swimming pool! Space (Playa den Bossa): Your visit to Ibiza won't be complete until you party in Space. There are 5 rooms where you can hear the best electronic music. Of course, it has a VIP area! Wherever you go, don't forget that you'll spend easily 50 € at the entrance and that a drink costs at least 7 €. So we recommend you go with a well filled wallet! Phenomenal! Every day is a chance for a photo opportunity like this. The most attractive point is at Cafe del Mar. No obligations! Just do whatever you have in mind. You can visit several shows, assist to folkloric festivities or try your luck at the casino of Eivissa. A recommendation is to see the sun go down at Café del Mar. A unique experience while you enjoy the sound of the relaxing music of this place. Of course, you can have an after dinner chat in one of the restaurants. The cuisine of Ibiza is varied and delicious. If you like fish dishes, we recommend you to choose a restaurant near the coast. You'll find many fish specialties and very high quality. If you want to change a bit and try international cuisine go to the inland. Nothing compares to a moment to yourself. Spoil yourself in one of the Wellness and Spa centers: Aguas de Ibiza, Atzaro, Bellmar, Can Curreu, Can Lluc, La Posidonia, Sirenis Vital Spa or Tesal Fenicia Spa Ibiza. As you can see, the island of Ibiza is very versatile, so you can go on a stylish holiday with the people you care about and do anything you like! Experience its unknown nature in the inland or, at the coast, on a boat. Find out which aspect of Ibiza's culture suits you the best. And for those that want to party without feeling old? Ibiza chooses you. Do you choose Ibiza? 1) Take a plane to the airport of Ibiza - Eivissa, which is at 8 km to the south of the capital. 2) Take the ferry from the mainland to the island of Ibiza. On Ibiza, the transport is very simple, you can use the bus, the taxi or rent a car. What about the public transport on the island? It's reasonable, but it depends on where and at what time you want to go. Click here for the updated timetables and bus stops of Ibiza and the rest of the island. Generally, it's very simple to rent a car. - Do you love privacy and quality time with family/friends when you're on a holiday? - Do you like to go where and whenever you want? - Are you fed up of people taking the last portion of your favourite dish in the buffet? - Would you like to have a barbecue? - Have you always wanted to have a private swimming pool? Have you answered 3 of the 5 questions with a yes? Then hiring a modern and relaxing villa on Ibiza is certainly something made to you! Lounge in modern Ibiza style!